Once you have created your domain email account, you can access it online through webmail. Webmail is a web-based (online) interface where you can access and manage your email messages. An example of a webmail service is Gmail.com. All of the domain email accounts you create comes with webmail access. Enter your email address and password, then click Sign In. You can also login to your webmail through the Email Accounts manager in your cPanel. 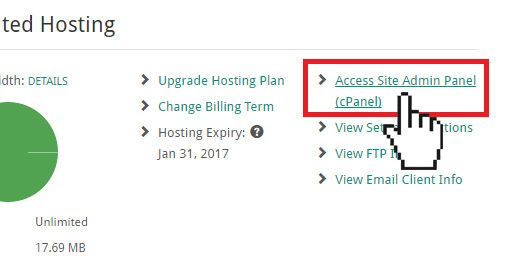 Click Access Site Admin Panel (cPanel). On the cPanel dashboard, scroll down to the Email section. Click Email Accounts. Scroll to the Email Accounts list to find the email account you want to sign into. Use the More drop-down menu to select Access Webmail. 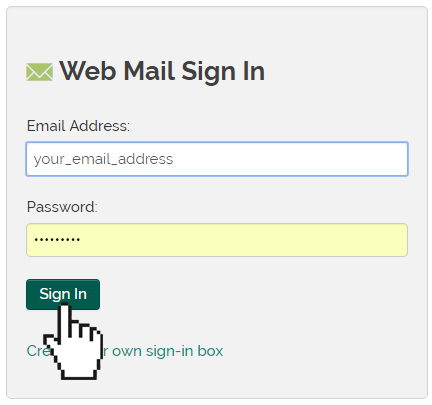 You can also create a custom webmail sign-in box and place the box on any webpage. 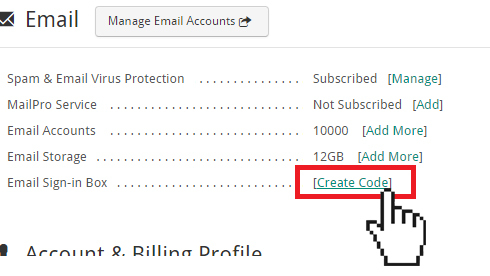 Scroll to the Email section and click Email Sign-in Box…Create Code. Select the desired sign-in box design. When ready, click Next. Enter the domain name where the sign-in box will be installed. Enter the sign-out URL. This is the page that you will be redirected to upon webmail sign-out. Copy and paste the generated code into the source file of your web page.